One night in Bangkok.....: Pukky's got talent! The last time I heard anyone play a ukulele, it was either Tiny Tim or Don Ho. I can't remember, because it was like 40 years ago. Well, they appear to be making a comeback. I started noticing our daughter Puk posting pictures of ukuleles and cases and such on Facebook. I thought it was just a cute fad thing she was going through. But, it turns out that she can actually play the mini guitar. Pukky has always had a nice singing voice, and can play a little guitar. But, she seems to be pretty serious with this. 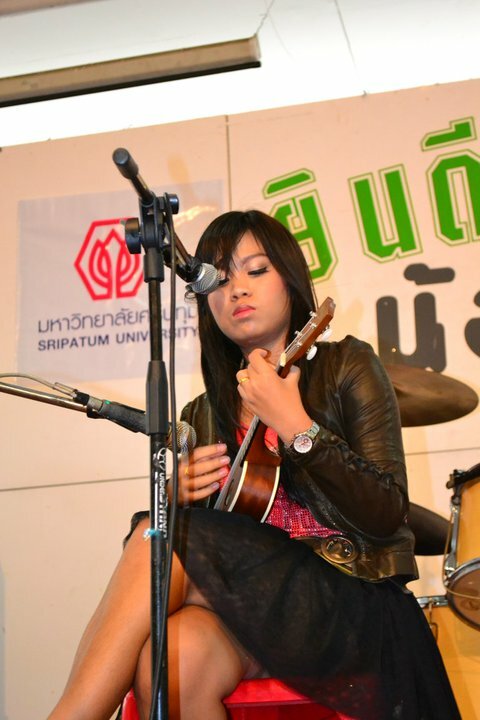 This photo was taken at a talent contest at her university. She won her division. Yayyyy!